Alex Stuart, Steff Farley, Charlie Porter, James Steel, AK Gurung, Justine Canady, Andrew Peak. School strikers raised demands around renewable energy, scrapping Trident and a ban on fracking, as well as cheaper public transport. Generally the demands focused on social need over profit and the need for systemic change to tackle the climate emergency. The next Youth Strike for Climate on Friday 15 March will be global. Climate change threatens a global catastrophe; we may only have ten years to reverse its effects. The student and labour movement should play a major part in this exciting new movement. NUS should supporting school students taking part in the walkout, producing guides on how to organise and seeking to use them to build lasting organisation in schools and colleges (sixth formers are members of NUS). To promote and mobilise for subsequent climate walkouts. To take motions regarding climate change into the NUS and Students’ Unions. To circulate a guide to help school students use the walkout to build lasting organisation in their schools and colleges. Motion 2: Strategy motion – amend with proposals! Maisie Sanders, Ross Tayler, Jacob Elliman, Bradley Allsopp, Aris Shukuroglou, Christie Neary, Justine Canady, Ella Wilkinson. The Student Left Network should exist to support, spread and link up local campaigns and struggles on campuses across the UK. It should lead campaigns on a national level, seeking to mobilise students on a mass scale around radical left demands. That means organising national mobilisations, speaker tours, meetings, direct action and demonstrations. We want to build a democratic, vibrant and militant student left with a culture of unity in action and open political discussion and debate. The student left is more effective when it is united, organising around a set of democratically-decided political ideas and demands. The SLN launch meeting adopted the Left Unity Charter: we should see this as a live document to be updated and debated at every SLN democratic event so that it continues to form our common ground as activists. We aim to take the politics and the spirit of grassroots student struggles into NUS and Student Unions to democratise and radicalise these institutions into political, campaigning bodies through which students can fight for our rights and to transform society. We need to break the bureaucracy which currently dominates NUS and SUs and build a movement which can support, pressure and hold to account left representatives. Unite the left to fight for NUS democracy! 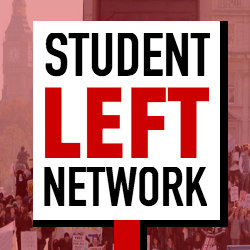 The Student Left Network will continue campaigning against the imposition of the anti-democratic reforms and for the reversal of the cuts imposed on the Trans Students’ Campaign, International Students’ Campaign, Nations’ Vice Presidents, LGBT+ Women’s Place and the Postgraduate and other sections. The reforms put to this year’s conference were outlined in a ‘White Paper’ which NUS sent out to Student Union sabbatical officers and CEOs for consultation. The proposals (in more detail here: tinyurl.com/nusreforms) will make it practically impossible for students to be able to exert any left wing pressure on NUS, let alone direct control. NUS will become even more of a bureaucratic club for careerists with barely any opportunity for political debate. We must campaign to stop them and argue positively for a democratic, campaigning NUS with genuine student control that organises grassroots campaigns on a mass scale, including demonstrations and direct action. We will put forward a vision of NUS as a vehicle for collective action that mobilises tens of thousands of its members in HE and FE to fight for students’ rights and a free, public and democratically owned education system, linking up with the labour movement. NUS should provide a political voice for student opposition to Tory attacks on education and on student living standards. At this year’s NUS Conference we will campaign for a democratic, fighting NUS and call for the rest of the left to unite around this campaign. The campaign will involve caucuses, a bulletin, tshirts, stickers and direct action. We will push for a no confidence vote in the NUS Trustee Board and NUS President Shakira Martin. We will campaign for candidates in elections who pledge support for a democratic, fighting NUS, alongside Student Left Network candidates Justine Canady for President and Ross Tayler for Welfare. This term we will organise a speaker tour on campuses around the country to talk about what fighting, democratic and radical NUS and student unions would look like and how we can build a movement that can exert the grassroots pressure to get there. Deliveroo couriers have low pay, and are falsely categorised as “self-employed independent contractors”, so missing out on most workers’ rights, including minimum wages. Deliveroo could afford to pay couriers significantly more. In recent months couriers have struck in various places across the country, and five times in Bristol, all of which caused Deliveroo to lose money, putting pressure on them. More strikes are planned across the country. To win will probably require repeated and escalating strikes. However, being low paid, many Deliveroo workers struggle to go on strike. Many support it in principle, and recognise that in the long run it will pay off, but feel they are financially struggling to the extent that they cannot afford to lose that pay. Bristol Couriers’ Network (IWGB affiliated), and the IWGB union nationally, have both recently started raising strike funds, to help offset the costs of striking to those most in need. To give a hint of the scale needed, if 100 couriers in one city each needed £40 per strike, to cover 3 strikes (in three different cities, or over three different days), that would require £12,000 altogether. Student Left Network activists should support the strikes, by going down to picket lines where there are some near our universities. We should also support them by raising money, both through encouraging donations from union and Labour Party branches and the like, and by organising fundraising events. Fundraising events are also good as socials for our activist groups, and for getting the word out to other students about the strikes. As many students are part time food couriers this is particularly important. Other motions were remitted to the National Committee.